PIKESVILLE, MD. — Baltimore Ravens quarterback, Joe Flacco, recently met with fans at the Hilton Doubletree located at 1726 Reisterstown Road on April 20 in Pikesville, Maryland. Fans were elated to meet the superbowl hero who made an appearance for a few hours to sign autographs and take photos with fans. 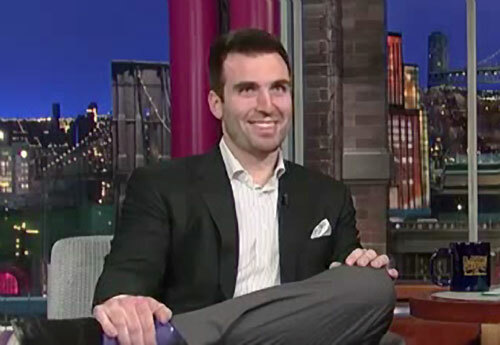 Photo shows Joe Flacco speaking on the David Letterman show about his Super Bowl win. Flacco was awarded the Super Bowl MVP and went on to sign a six-year contract with the Ravens worth over $120 million, making hime the highet paid quarteback in NFL history. Watch video where Joe Flacco speaks about his new contract and winning the Super Bowl. Joe Flacco is also a popular motivational speaker says Sports Speakers 360. If you would like to book football players like Joe Flacco for a speaking engagement, endorsement, charity fundraiser or special event, you can request Joe Flacco speaker and Joe Flacco agent info or call 855.303.5450.